Share the post "Indigo Bunting"
For sure, it was a race horse of a Monday. Even though I arrived at the office earlier, I still found myself pressed for time to get everything accomplished that I had planned. Of course, there were more drop-ins and phone calls than normal which I was happy about. It was an absolutely beauteous day with the humidity being low and the wind helping to keep our temperatures down. I’m still concerned about the force of our recent thunderstorms, and hoping it’s not going to be something we may be facing the rest of our summer. It’s too bad I can’t clone myself, because I’d be opening a tree service here in North Iowa. With the many thousands of ash trees that’ll be dying, and the more numerous storm damages, our tree surgeons are going to making out like bandits. The ones we have here in Mason City have done exceptionally well for themselves by having a near corner on our market. I only wish our City would get into the business where they’d be more reasonable with pricing while bring much needed money into our City’s coffers. Over a year ago I had two trees that suffered severe damage from last May’s windstorm, so I called one of our locals to get a giant branch that was dangling, cut away from its trunk. He charged me a hefty price to have it removed, and then several days later said I’d best get the main trunk removed because it was grossly out of balance. I understood that, but the price he quoted me was ridiculously high, so I went on a hunt to find someone else, and fortunately I did. I actually was able to get both monster trees cut down for the price of what the first one quoted for just one. Since I’d done business with the first company for years, I knew he’d be upset with me for jumping ship, and later found he was angry enough at me to purchase a home from another Realtor. Some day when I see him I’ll have to ask, “Did the agent you purchased that house from give you as much business over the years as I did?” I’ll also mention how many people over the years I referred to him which since then, was nevermore. Whenever business people do something like that to me, I simply send them down as just another example of blind selfishness coupled with an all-consuming greed. Isn’t real community living supposed to be about us instead of me? I’d like to put another plug in for Brandon Neve’s listing at 1137 Manor Drive. It was just recently reduced to $159,900 which as far as I’m concerned, has placed it all the more in a competitive price range. The home next door just recently sold in the $170K price range and it has exactly the same square footage, and doesn’t even have the curb appeal that Brandon’s has. Someone recently mentioned that the kitchen/dining area appeared smaller than what they’d like. The unfortunate reason it appears smaller is because the owners still live there and they have a great deal of furniture. I’ve sold many homes in that district over the years, and that home’s kitchen/dining area is much larger than what you’d normally find. By the way, Brandon is having a public open house on it this coming Sunday, so if you, or anyone you know is thinking about making a move, please stop by and have a look. It’s a rock sold home that’s been well cared for. Since I had several groups of photos to take at homes today, my camera was with me nearly the entire time. 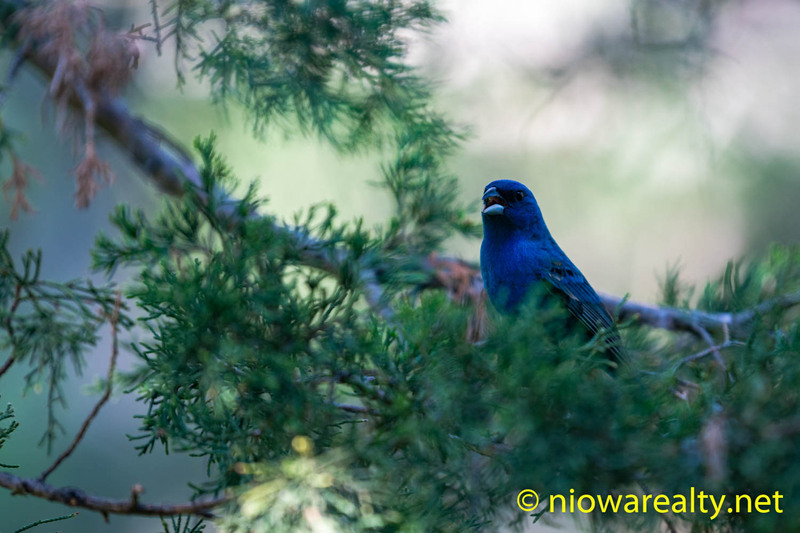 To my absolute delight, I spied an Indigo Bunting in a cedar tree, and it somehow must’ve wanted its photo taken because I was able to get close enough to snap the above photo. Isn’t he cute? It’s been only on rare occasions when having seen one. They’re related to the Cardinal family which comes as no surprise. The Indigo Buntings are brilliant blue while the Cardinals are flaming red. I’m glad to see more of our native birds returning instead of finding all the more of those vile Crows and Starlings over-populating North Iowa. Wishing you all a pleasant summer’s eve, along with an absolutely delightful Tuesday. Tonight’s one-liner is: Shark salespeople know when to invoke their evocative timbres.